"If you ever feel that in our conversations you must turn to discussing the weather, I'd rather experience an uncomfortable silence than descend to that level of insincere pleasantry." No kidding, he actually talks like this, it's great. Bryan now resides in Edmonton, and not being an Oilers fan, I imagine he spends most of his days and evenings awash in a sea of the most sincere silence. However, now that our lives at ICF are more intertwined with our chlorophyllic friends, I feel it necessary to devote a small portion of communique to weather. Here in Vancouver, we are experiencing what can be described as 'less than ideal' growing conditions; although, this isn't true for all of our crops: the russian red kale is tickled pink, the gai-lan can't believe its luck, and the romaine lettuce is holding out like a Canadian front door - unbolted. Even our prima donna tomatoes are happy, covered snugly in their polyethylene shelters. But in ICF's gardens, it's the Cucurbits that are most chagrin. 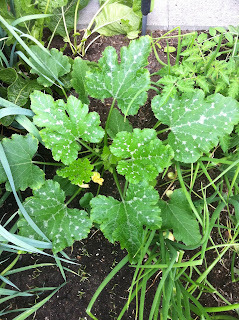 Our summer squash and cucumbers are patiently waiting for a solid week or two of sun and heat to live up to their reputation of fecundity and near intolerable productivity. This time last year, our boxes were beginning to overflow with crooknecks, pattypans, and buttersticks. So I guess the whole point of this message is to say that, weather permitting, the zucchini and cukes are on their way! Here's a picture of one of our little troopers, you can almost feel his/her/its frustration (monoecious plants are hard to personify with gender specific possessive adjectives). And my unfeigned apologies for the topic Bryan. I hear the Oil got Smitty back though, if that's any consolation.